Welcome to Walden Pond, the famed temporary home of Henry David Thoreau as well as the birthplace of modern conservation. This gorgeous protected pond is nestled in mostly undeveloped woods that total to an impressive 2,680 acres. 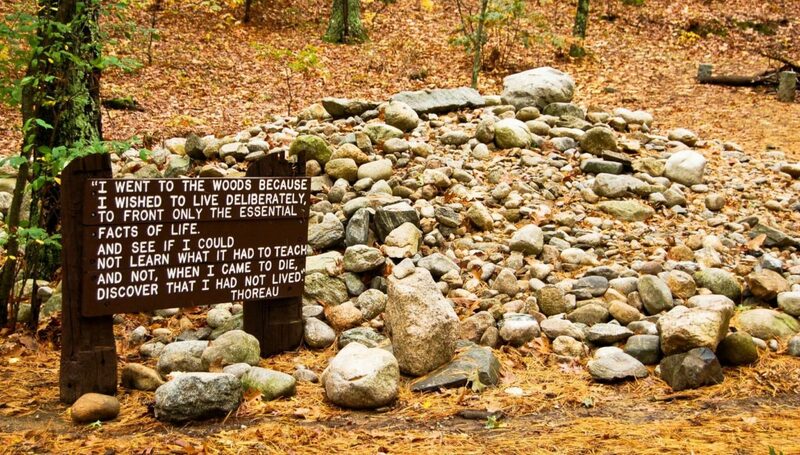 Henry David Thoreau lived here from 1845 to 1847, a small amount of time that provided a great amount of material for his popular book, Walden, as well as helped inspire awareness and respect for the natural environment. This site is today designated a National Historic Landmark as well as the birthplace of the conservation movement. Besides holding all this interesting literary and historical information, this site is also a bit of a geographical wonder, being one of the only kettle-hole deep glacier pond’s in the area, a 102 foot deep, 64.5 acre pond created millions of years ago by melting and moving glaciers. During the summer, guests use this spot as a popular swimming destination, and in the spring and fall visitors love hiking the trails and visiting the replica of Thoreau’s one-room cabin, complete with period appropriate furnishings. Park interpreters will be happy to give your group a tour, taking you through the beach area, trails, and gorgeous woodland scenery that surrounds the 3 main buildings your group can visit. You may also choose any of the many weekly educational programs, interpretive programs, or guided walks while here, or just stroll around and snap photos on your own (it’s so beautiful here be sure you bring your camera). Before you go stop by the Tsongas Gallery, Bookstore, or Gift Shop that holds many gifts such as hats, books, ornaments, jewelry, artwork, prints, manuscripts, and photos throughout!